Available at no additional cost! Thanks for your interest in our Advanced Meter Program! This program, approved by the Kentucky Public Service Commission in 2014, is offered as one of our energy efficiency programs. The voluntary Advanced Meter Program is available to the first combined 10,000 LG&E and 10,000 KU residential electric (RS rate) and small commercial (GS rate) customers who sign up. With online near real-time access to usage information, customers can take a closer look to see when they are using energy. Enroll Now with My Account. If you are already an AMP participant, log in through My Account to access your customized MyMeter dashboard. 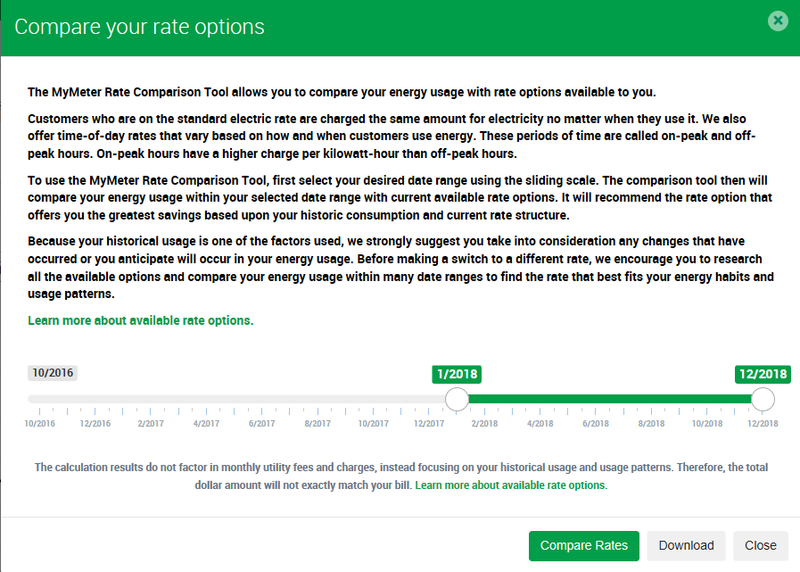 The Rate Comparison Tool displays the rate option that offers you the greatest savings based on your historic consumption and rates currently offered by the company. Standard Electric Rate: Customers on the standard electric rate are charged the same amount for electricity no matter when they use it. Time-of-Day Rates: We also offer time-of-day rates that vary based on how and when you use energy. These periods of time are called on-peak and off-peak hours. On-peak hours have a higher charge per kilowatt-hour than off-peak hours. Before making a switch to a different rate, you should research all available options and use this tool to compare your energy usage within many date ranges to find the rate that best fits your energy habits and usage patterns. Because weather plays a big part in the amount of energy you use, you may want to do your rate comparisons when you have at least an entire year’s worth of usage. 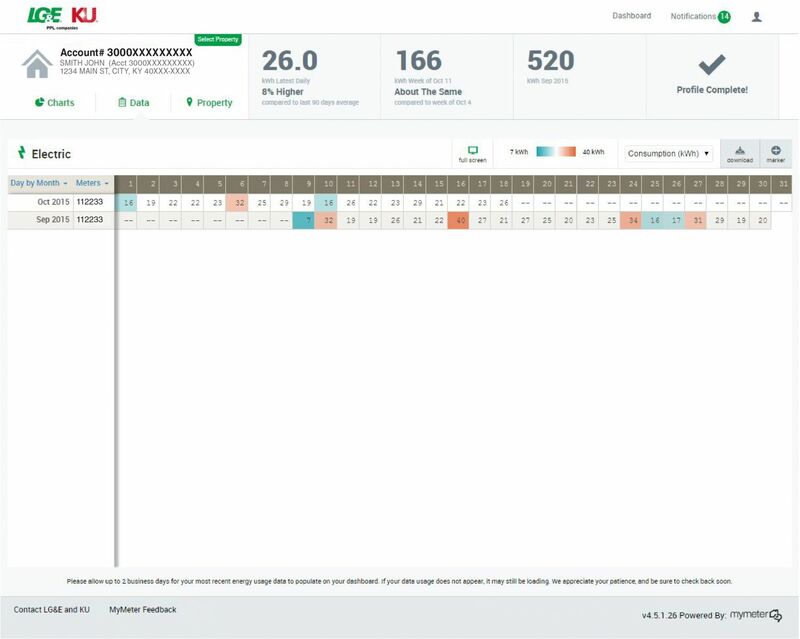 This will allow you to compare rates at various times of the year. You’ll be able to see how estimated costs for your usage during the summer and winter months as well as during the milder temperatures in spring and fall. And if you have multiple years of data, you’ll be able to compare a milder summer or winter one year to a more extreme summer or winter another year. IMPORTANT NOTE: Because these estimates are based on your historical usage, we strongly suggest you take into account any changes that have occurred or you anticipate will occur in your energy usage patterns before changing rates. Learn more about available rate options. 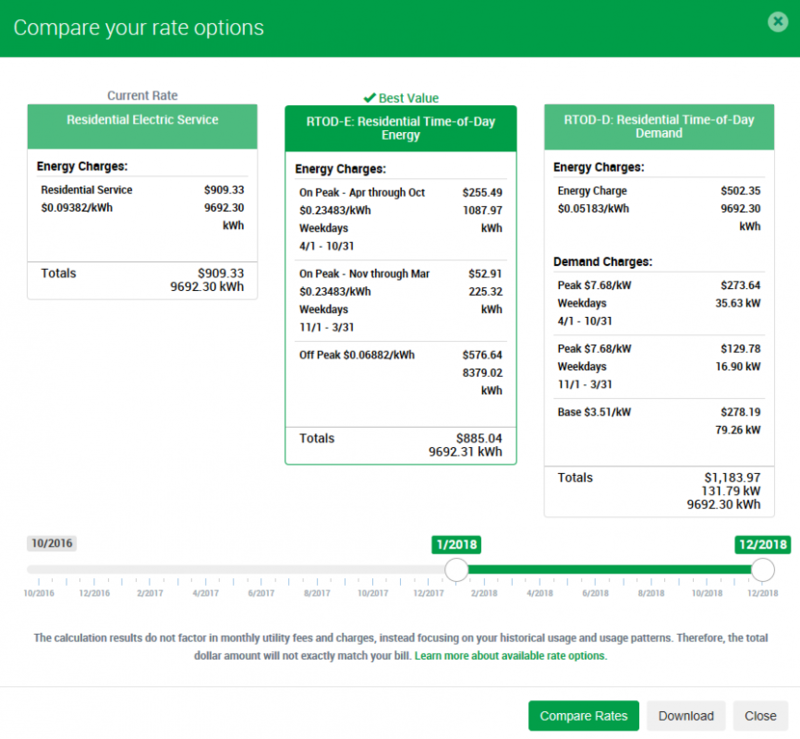 View your data consumption in kilowatt-hours or dollars to help you estimate your monthly bill. 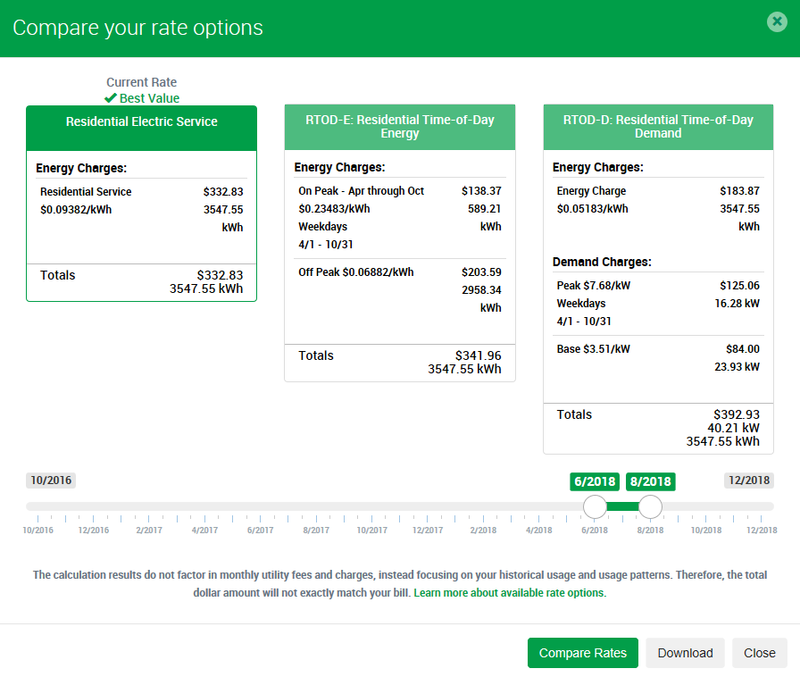 Select "Dollar ($)" from the drop-down menu to display your estimated electric charges, which reflects your energy usage multiplied by your current electric rate. View your data consumption in dollars by selecting "Dollars ($)" from the drop-down menu. When viewing your energy usage information, you may choose to view your information by 15-minute increments, day, week, month or year. Review these setting locations to learn where you can adjust your view. In "Chart View," adjust your energy usage view setting using the drop-down menu in the top right corner. In "Data View," this calendar-style format allows you to adjust your energy usage view setting using the drop-down menu labeled "Day by Month" in the top left corner. In “Charts View,” you’ll now be able to track and compare your energy usage in several views – by day, week, month or year. Check out how your energy use compares to your local weather conditions. Use the “Zoom” feature, take a closer look at a specific date range or single day. 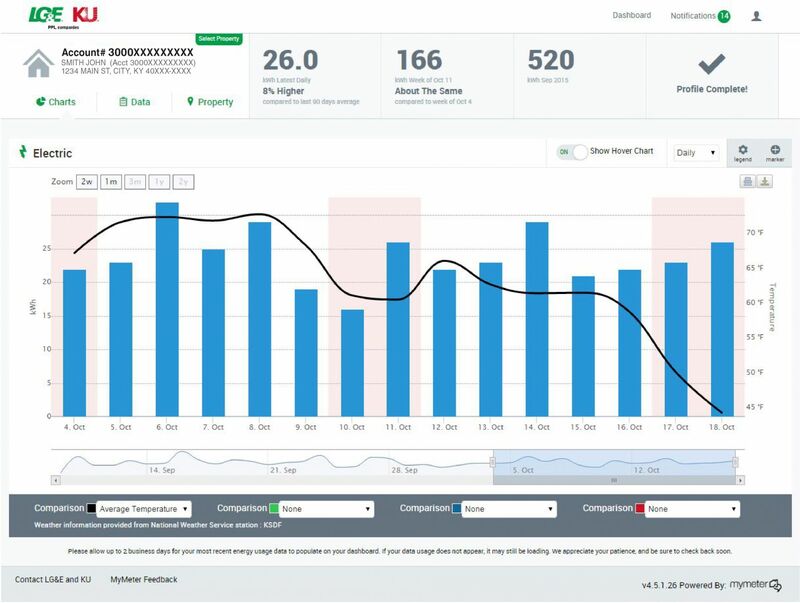 Over time as the information from your meter accumulates in your MyMeter dashboard, you’ll have the ability to compare changes in your energy usage from the previous week, month or 90-day average. For your convenience, your energy usage comparisons can be found in the top leader bar above your energy usage and next to your account information. By clicking on "Data View," you can compare how your energy usage fluctuates over a period of time using this calendar-style format. Data View's unique heat map feature will compare your energy usage over time. Blue-shaded squares indicate when your energy usage is lower than average, and red-shaded squares indicate when your energy usage is higher than average. 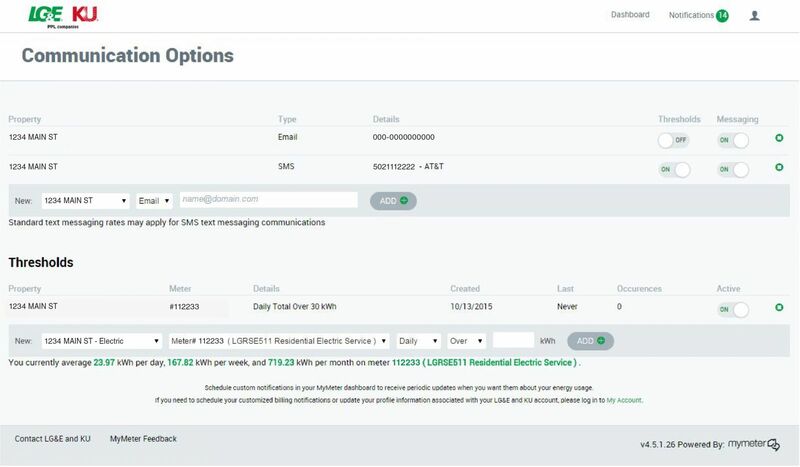 You can schedule MyMeter notifications under “Communication Options” to receive customized updates about your energy usage by text or email. By setting threshold limits, you can request and receive a MyMeter notification when you’ve reached your desired limit. While you can set your threshold limits and request how you prefer to receive these updates, all notifications are sent at 11 a.m., Eastern Standard Time. Please remember your usage information is loaded in your MyMeter dashboard within 2 business days, so be sure to set your thresholds with this in mind and allow yourself time to make any adjustments before reaching your maximum limit. If you need to schedule your customized billing notifications associated with your LG&E and KU account, please log in to your online account to make these updates. 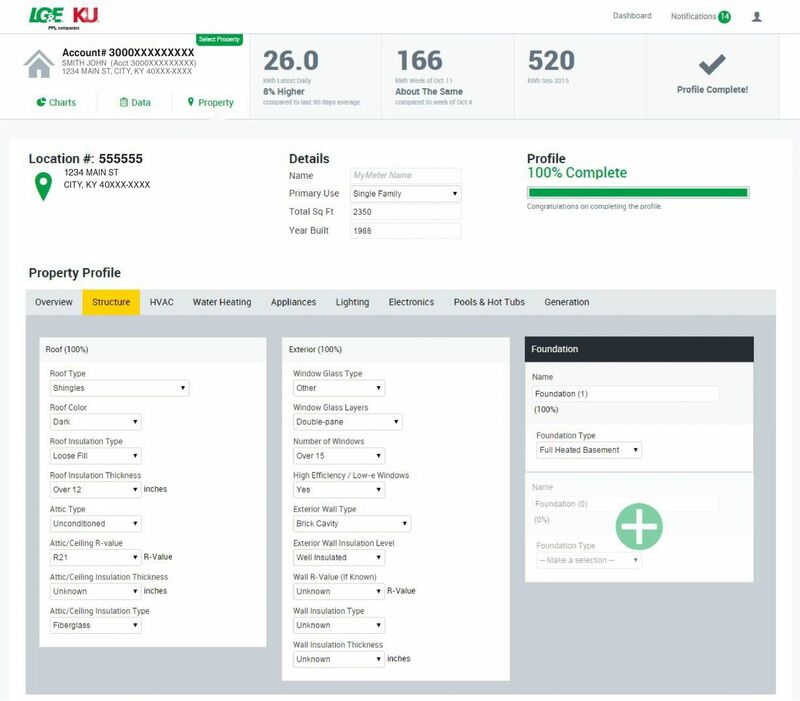 By providing basic information about your property – such as size, age of construction and types of appliances – you can create a more customized experience and gain more insight into how you use energy. You may update this information at any time if you make changes or improvements that could impact your energy use. Plus, your improvements may qualify for monetary rebates and incentives through LG&E and KU's Energy Efficiency Programs. Your profile information is specific to your MyMeter dashboard only. If you need to update your profile information associated with your LG&E and KU account, please log in to your online account to make these updates.